New York police were looking for two persons of interest in last week's motorcycle road rage attack and were investigating why an undercover officer who may have been on the scene didn't intervene. NBC's Stephanie Gosk reports. A fourth biker was charged Monday in connection with a high-speed chase that ended in an assault on a family's SUV, law enforcement officials said. 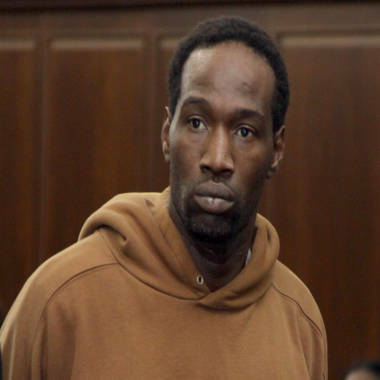 The man, Craig Wright, 29, of Brooklyn, was charged with gang assault and assault. He is believed to be the man seen on video punching and kicking the driver, Alexian Lien, while he was on the ground, officials told NBC New York. The arrest comes a day after a third motorcyclist, Reginald Chance, 37, was arraigned on charges that he used his helmet to smash through the front window of Lien's Range Rover before he was pulled from the vehicle and assaulted in front of his wife and toddler. Reginald Chance, accused of triggering a bloody confrontation between bikers and an SUV driver in New York last week. Chance was charged with gang assault, assault, criminal possession of a weapon, criminal mischief and unlawful imprisonment. A judge set bail at $100,000. Police said they are also seeking a Long Island man in connection with the chase and assault. The bikers, taking part in an unauthorized daredevil rally dubbed "Hollywood Stuntz" on Sept. 29, swarmed around Lien's vehicle on the West Side Highway in New York after he clipped Christopher Cruz's back tire. Cruz was later charged with reckless driving and unlawful imprisonment for slowing down in front of Lien, who was forced to halt by other bikers, some of whom began attacking the SUV with their helmets and slashing its tires, police said. Lien then speeded off, running down a rider, Edwin "Jay" Mieses, who was standing in front of him. Gloria Allred, attorney for injured motorcyclist Edwin Mieses Jr., tells reporters that Mieses was trying to help the driver of the SUV defuse the situation when he was run over. The Mieses family's high-profile lawyer, Gloria Allred, portrayed him as an innocent victim who was trying to calm tempers and disperse the crowd after the fender bender. He suffered a broken spine, a torn aortic valve and a punctured lung. "His sole intention was to defuse the situation," she said Friday, adding that doctors were unsure whether he would ever walk again. After a 50-block chase, the group cornered Lien, smashed in his window with their helmets and beat him, police said. Lien was treated for his injuries and released from a New York area hospital. His wife, Rosalyn Ng, released a statement Thursday expressing sympathy for Mieses but said her husband had no choice but to flee the bikers because it was a "life-threatening situation." Neither Lien or Mieses have been charged with a crime. Yolanda Santiago fights back tears as she speaks with WHDH-TV about her son, one of the motorcyclists who remains in a medically induced coma after allegedly being run over by the driver a black Range Rover during an altercation on New York City's West Side Highway. Chance's attorney said the gang assault charge was excessive because his client didn't actually assault the driver. "My client obviously overreacted in smashing the window, but beyond that he was not a participant in any assault on the victim," said the lawyer, Gregory Watts. Anyone with information about the incident is asked to call Crime Stoppers at 1-800-577-TIPS (8477) or text their tips to 274637 (CRIMES) then enter TIP577.